Simon & Schuster, 9781476794358, 288pp. “The evangelist of entrepreneurship” (The Economist) reveals the true stories about how a range of entrepreneurs created their successful start-ups: hint, many of them never began with a business plan. "Cerner, now with 25,000 associates, started with conversations over a picnic table in a public park. We never had a business plan. This book tells the real story of why most companies begin. If there is one book that aspiring entrepreneurs should read, this is it!" 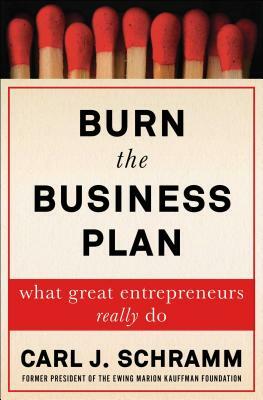 "Based on data and experience rather than hype, Burn the Business Plan is a timely antidote to the Silicon Valley mythology of startup wonder kids. I found this book deeply inspiring and confidence-building, and think all entrepreneurs, new and experienced, should read it." "No other book builds its advice for would-be entrepreneurs on such a solid factual basis. Readers can explore how to prepare themselves to become entrepreneurs long before starting a company, the best time in their careers to start, and what it will take to make their companies not just survive but flourish. This is the best book that anyone thinking about starting a business should read."